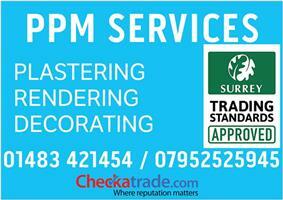 PPM Services - Plasterer based in Godalming, Surrey. We are a family run business with over 20 years’ experience in the building industry. We specialize in most aspects of Plastering and Rendering, Re Skims, General and Patch Plastering, EWI Insulated Rendering, Coving, Plaster Boarding.